Amber and Yellow warnings of wind issued for Monday the 8th February 2016. 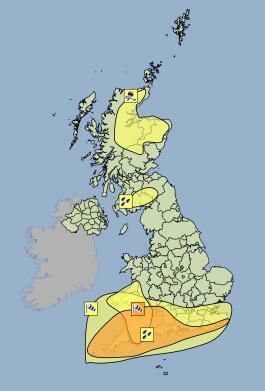 The Met Office have issued an Amber weather warning of wind for the morning of the 8th February, as Storm Imogen looks set to bring potentially distructive winds to the South West, South East and South Wales. An area of very strong winds is likely to extend east across southwest England and parts of central southern England on Monday morning. Gusts of 60-70 mph are likely widely, with 80 mph gusts in exposed coastal areas, particularly Cornwall and North Devon, and also through the Bristol Channel. Some very large waves are also likely to affect many coasts, in particular north coasts of Cornwall and Devon. The public are advised to be prepared for disruption to transport, and the possibility of damage to trees and structures. Disruptions to power are also a possibilty. An area of low pressure is expected to move eastwards across the UK on Monday with a swathe of very strong winds around its southern flank, which will affect parts of southern Britain. The winds are likely to be very gusty at times, particularly in association with heavy showers running across these areas. There remains some uncertainty in northward and eastward extent of the damaging winds as well as the peak strengths and so this warning will be kept under review. For regular updates visit our Facebook page, click the ‘Like’ button and then click the ‘Follow’ button. Updates will then appear in your Facebook news feed.